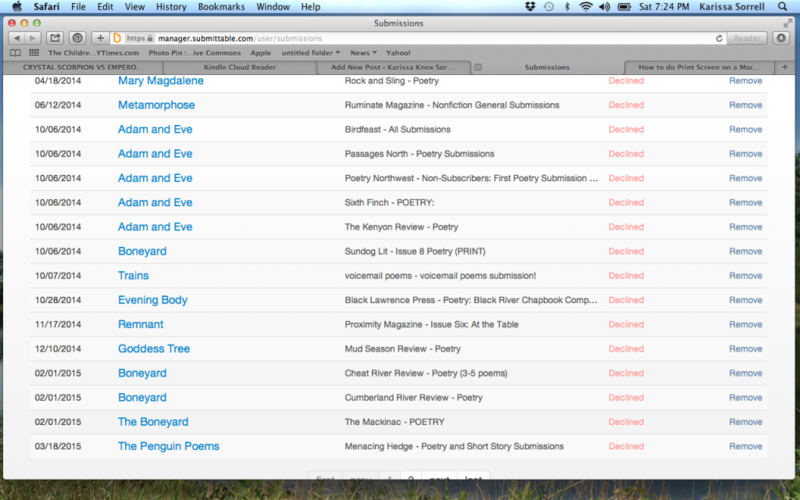 Keep in mind that this is the bottom of the most recent page, but there are more rejections if you were to scroll up. Also note that most Declines are for a set of five poems, so if you are counting specific poem rejections, you’d have to multiply each Decline by five. This doesn’t include an Excel spreadsheet I have that currently has 172 rejections logged. Plus there are a few email rejections that never got put in the spreadsheet. 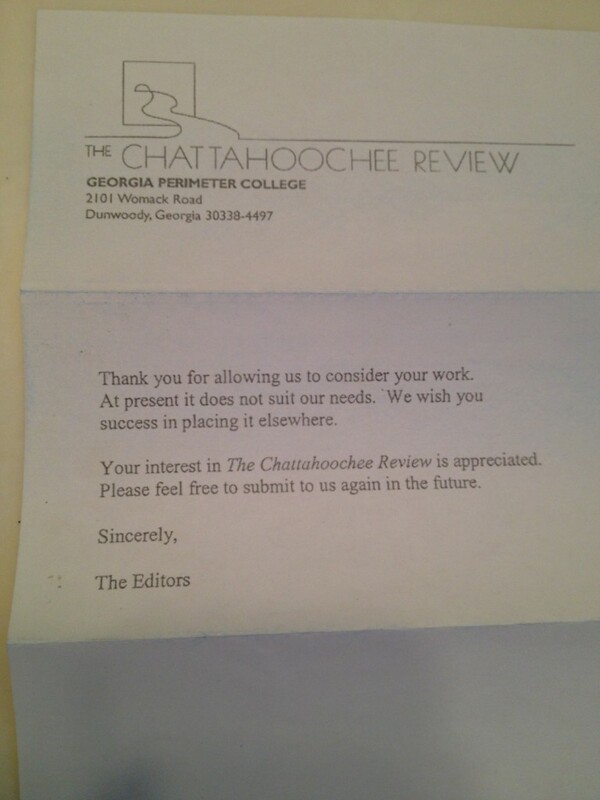 It’s safe to say I have received over 250 rejections over the course of about six years. Many poets will receive that many or more in a year. I just don’t send out that many poems. A journal rejection that comes quickly is often most disappointing, because it means the journal editor immediately knew he/she didn’t want your poems. A journal rejection that comes slowly may not be as biting simply because it could mean that your poems made it through several rounds of cuts. I really like how Submittable has an “In Progress” feature so you can see when your poems are being considered and read by editors. If my poems are “In Progress” for a while before they are rejected, I actually take that as encouragement because it means my poems were in the running for a while. When dealing with rejection, I must start at a place where I believe I am enough. That’s my word for 2015, and I have come back to it time and again this year. This step is probably the hardest one for me. I must not take the rejection of my writing as a rejection of my being. Once I believe that I am enough, then I can move forward into the work of dealing with rejection. Part of this work is realizing that different editors have different tastes, and just because one editor rejects my poems doesn’t mean another one will. There are times when I truly feel that my poems are high quality and are worth publishing. If they get rejected, I send them to another journal. Another part of this work is realizing that maybe my writing is not yet high quality. When a particular poem or essay has continuously been rejected, I might withdraw it from the submission cycle and either revise it or just write it off as mediocre writing that probably shouldn’t be published anyway. That’s also another caution that I have to remind myself of: Don’t send out work that is not yet truly finished!! When I complete a new poem, I want to send it out immediately. I have found that it is good practice to let it sit for at least a week to make sure that after the joy of writing something new has worn off, it is, in fact, a quality poem. Here is the rub: Believing that you are enough does not mean that every poem you write comes out perfectly or that you never need to revise!! Believing I am enough means that I know that my writing comes from the sacred, creative space inside of me that is valuable and beloved. It means that I am at home in my my own skin and my own personhood, and I am not constantly scrambling to be more. Even when I am able to get in that place of feeling enough, I still have to do the hard work of creating. At any rate, I do allow myself to feel disappointment after a rejection, but most of the time, I am able to move on from that pretty quickly. To date I can only think of two rejections that bothered me for several days. Also, sometimes I see rejections as successes. What I mean by that is I will occasionally get a personal rejection that encourages me to submit again or specifically praises my poems. It might seem weird for someone to say Good job, but not quite good enough. However, these personal messages are signs that I should, indeed, continue writing, and I should not give up. There is a lot of competition out there, and a personal rejection is sort of like 4th place or Honorable Mention. I actually found this Rejection Wiki recently that shows you tiered rejections for literary journals. So it appears that some journals have differently worded rejections for different tiers of poems. If your poem was very close to making it, your rejection might sound kinder or more personal than if your poem was an immediate no. Interesting. But I can’t get caught up in that! Finally, a last thing that helps me deal with rejections is other writers. I am a member of a closed Facebook group for poets that has a monthly “Brag Your Rejections” thread. It’s great to see how many other writers are going through the same thing, and there is always a ton of encouragement and cheerleading. A few kind words from a fellow writer can go a long way. Thanks for writing about this topic. I am gearing up for doing poem submissions again after a period of time when I have been adding to my skills, especially my revision skills with a group of local poets and some workshops. I know my work is stronger, but I also know that it will be rejected – a lot. I’m hoping that I may get my first journal acceptance if I persevere. So far, I have been in anthologies, but not journals. It will come, Joanne! Good luck to you! Great post! I’m a fiction writer, and in the process of sending queries and submissions to agents, with much the same results. This submissions business is not for wimps! It’s interesting to hear about it from a poet’s perspective–I know the process isn’t exactly the same, but the feelings those rejections bring are universal. I know exactly what you mean by the different reactions–some rejections sting, and some actually inspire! Best wishes for your writing! Best of luck to you, Brenna! 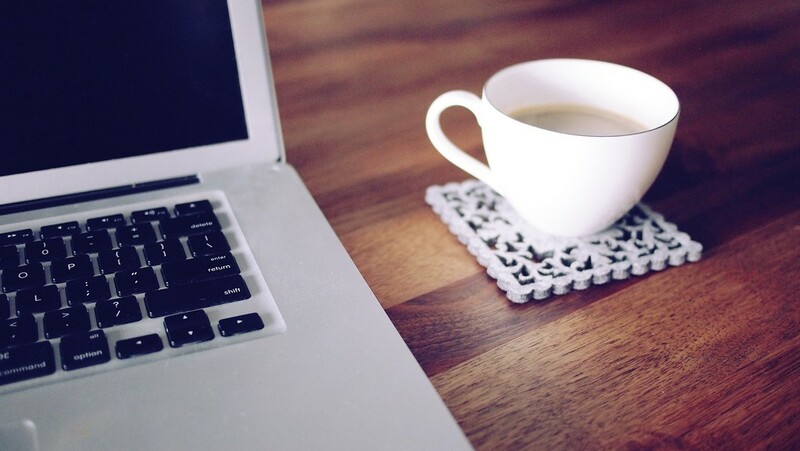 Have you written a novel? I actually wrote a spiritual memoir and queried a few agents. No dice. For a variety of reasons, I’ve decided not to pursue publishing that manuscript right now. It was disappointing to not hear back from agents, though!